I read Freedom first, which spoiled me for this one. Franzen got better with time, developing his voice and narrative strength in the off years in between Great American Novels. 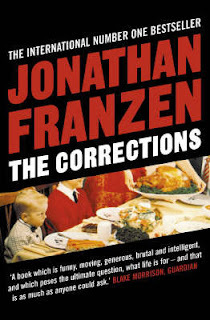 By comparison, this one comes off as a grad school literary exercise, with Franzen finding laborious ways to insert the word "correction" in as many different tenses as possible every 5 pages or so. But despite the formula, or maybe even because of it, Franzen squeezes out astounding insights into middle-age angst and the humiliating death march into old age. His most powerful passages pry open the mind of its saddest character, the family patriarch who tangles with dementia, losing more of himself in each bout with hallucinatory angst. Franzen's penchant for giving overly cute names to law firms, corporations and pharmaceutical wonderdrugs is as distracting as his use of the title, but the trying-too-hard cuteness doesn't detract much from the heart of his meandering story of mismatched, dysfunctional siblings who orbit their rotting nuclear parental centers. The Corrections is a book about spectacularly creative failures that ambitions seek and find in life's dark corridors, and as depressing as it is, its ability to illuminate the grim shared experiences that await us all manages to grant the novel a slice of encouragement of the human spirit it mocks, twists, steps on and ... yes ... corrects.